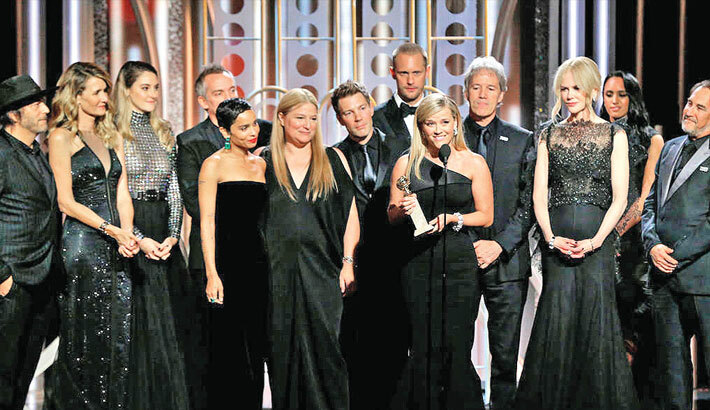 Big Little Lies and 'Three Billboards Outside Epping, Missouri' were the big winners at the 75th Golden Globe Awards, picking up four prizes each. Nicole Kidman was the first to take home an award at the Beverly Hilton in Beverly Hills on Sunday (07.01.18) evening, scooping Best Actress, Limited Series or Television Movie for her role as domestic abuse victim Celeste Wright in the HBO show and used her time on the podium to speak about her hopes for ''change''. The 50-year-old actress then praised her husband Keith Urban and her beloved mother Janelle. Nicole's on-screen husband, Alexander Skarsgard, paid tribute to her as he picked up the Best Supporting Actor in a Series, Limited Series or TV Movie award, as well as singling out author Liane Moriarty and producer Bruno Papandrea. He said: ''I am here tonight because I had the privilege of working with a group of extraordinarily talented women. Laura was also a winner, taking home Best Supporting Actress in a Series, Limited Series or TV Movie, and won praise for her powerful speech. The series' fourth award was for Best Limited Series or TV Movie. Meanwhile, 'Three Billboards Outside Epping, Missouri' picked up the coveted Best Motion Picture, Drama accolade, as well as Best Screenplay, while Frances McDormand took home Best Performance by an Actress in a Motion Picture, Drama and her co-star Sam Rockwell won Best Performance by an Actor in a Supporting Role in a Motion Picture. Like many of the winners, Frances addressed the issue of sexual misconduct in her speech. Other big winners on the night included 'The Disaster Artist' star James Franco, who won Best Performance by an Actor in a Motion Picture, Comedy or Musical and Gary Oldman, who took home the same honour in the Drama category for his portrayal of Winston Churchill in 'The Darkest Hour', while Saoirse Ronan's role in 'Lady Bird' earned her the Best Performance by an Actress in a Motion Picture, Comedy or Musical statuette, and her movie was also named Best Motion Picture, Comedy or Musical. Aziz Ansari's turn in 'Master Of None' won him Best Performance by an Actor in a Television Series, Comedy or Musical, while the acting honours in the TV Drama categories went to Elisabeth Moss for 'The Handmaid's Tale' - which was named Best TV Series, Drama - and Sterling K. Brown for 'This Is Us'. Seth Meyers was the host of this year's ceremony.